Claim five free prints worth up to £13.40, get 25 grungy hi-res texture files, watch 55 minutes of new how-to videos, find the perfect DSLR or CSC with our updated Complete Camera Guide, and more. 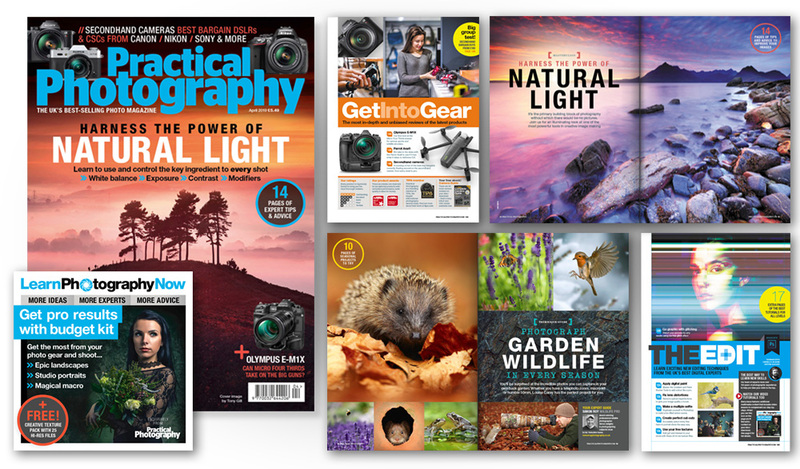 Get to grips with photography’s most powerful building block with our in-depth 14-page guide to using and controlling natural light. Includes advice on white balance, exposure, contrast and modifiers. Transform your garden into a photo-friendly natural world haven with four seasonal projects that anyone can try, with top tips from award-winning pro Simon Roy. Hairdresser extraordinaire Kai Wan has created a meticulously coiffured portfolio of hair and beauty photography and here shares his experiences and expertise. Hold the moon in your hands with this surreal project that involves both camera and editing skills. You’ll even find a lunar start image on your disc/download. Working alongside UK charity Street Child, Chris Parkes has been documenting Nigeria’s efforts to rebuild communities affected by ongoing terrorist attacks. Our new-look editing section includes tutorials on photo glitching, the Gradient and Paint Bucket Tools, correcting lens distortions, accurate cut-outs and more. Buying a ‘pro’ setup for less than £1000, choosing the right type of tripod, duplicating Layer Masks, holding your camera correctly, and Pen Tool selections. Take a closer look at your camera’s advanced exposure modes, from bulb and silent shooting to multiple exposures, time lapse and interval timer. Take a first look at Olympus’ pro-spec E-M1X and the Parrot Anafi drone, plus compare the ten best secondhand bargain buys from £180.